Motorcycles and a black leather jacket are synonymous today, but it has not always been that way. Early versions were adapted from soldier and pilot uniforms during the First World War, when black leather jackets were associated with speed and adventure. Interestingly, it was Hollywood and the movies that gave the motorcycle jacket its enduring mystique, reaching iconic status through the cool of Marlon Brando and James Dean. 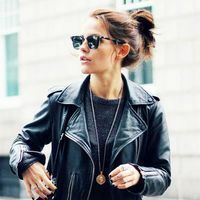 The black leather jacket of today, however, can come in many forms, and is not only favored by the rebellious. It can work well with any personality, from all things girly to grunge. A girl or guy can stay cute with a sophisticated and simple style, or instead opt for a model embellished with studs and spikes to reveal an inner rebel!